During the week of July 3rd, the PONTE and XF-ACTORS projects carried out a remote sensing airborne campaign over the area infected by Xylella fastidiosa in the Apulia region. The goal of the campaign was to acquire high resolution hyperspectral and thermal images from 3 areas of 1200 ha within the infected zone. 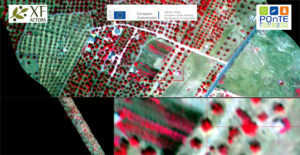 This activity involved both plane and field surveys, and has been managed by four partners from XF-ACTORS and POnTE projects: the Joint Research Centre (JRC) in Ispra (Italy), European Commission, that coordinated the remote sensing airborne campaign, and the CNR-IPSP (Italy), DiSSPA-UNIBA (Italy) and IAS-CSIC (Cordoba, Spain), which participated in the field work acquiring auxiliary data. 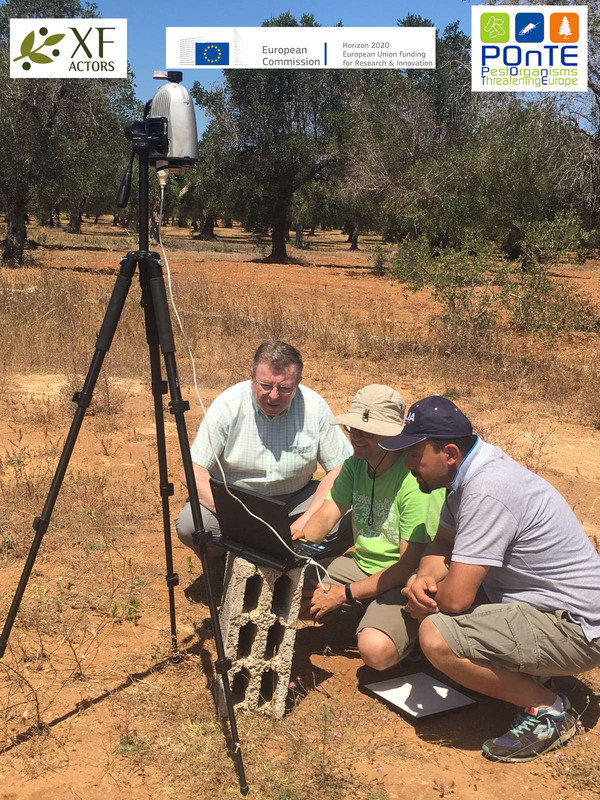 The auxiliary data is particularly needed for the calibration of the remote sensing imagery, and for the evaluation of incidence and severity levels of Xylella fastidiosa (Xf) symptoms in olive trees. This work makes progress on the early detection of Xf symptoms. It uses physiological indicators derived from hyperspectral and thermal imagery, in particular related to stomatal conductance and photosynthesis changes occurring to Xf-affected trees, which are detectable by the advanced remote sensing technology installed on the plane. This campaign was carried out for the second time over the Apulian Xf-infected area. 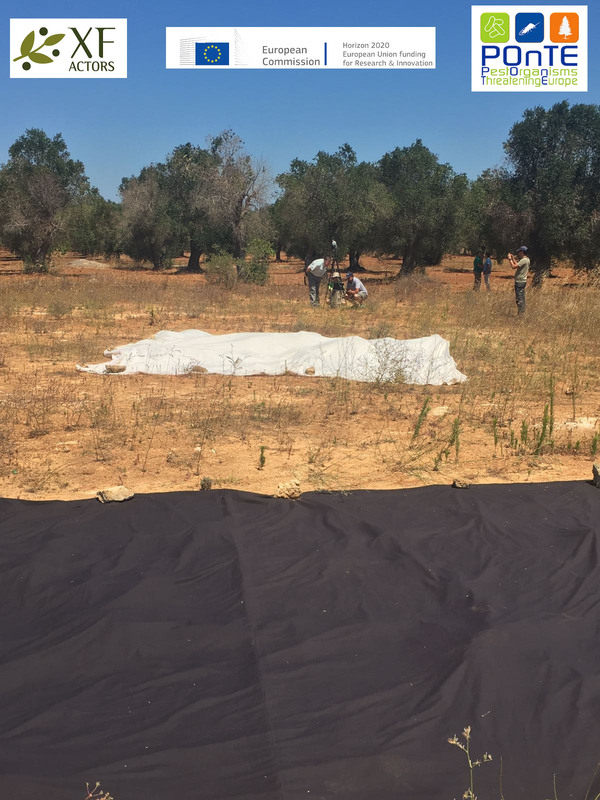 The first round, held in June 2016, allowed to image approximately 200,000 olive trees from the entire area, with more than 4,000 trees evaluated in the field from 20 selected orchards, as well as laboratory tests on a large number of asymptomatic trees. The overall objective of the campaign is to develop a robust remote-sensing based method for early detection of Xf infections and the automatic classification of Xf infection levels in trees over large areas. 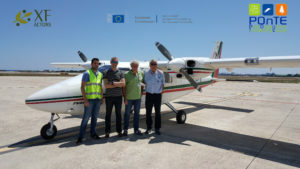 Pilot and co-pilot (CGR company, Parma, Italy) on the right side of the image, Alberto Hornero (on the left, IAS-CSIC, Spain) and Pablo J. Zarco-Tejada (JRC, European Commission), second left, ready for the flight. 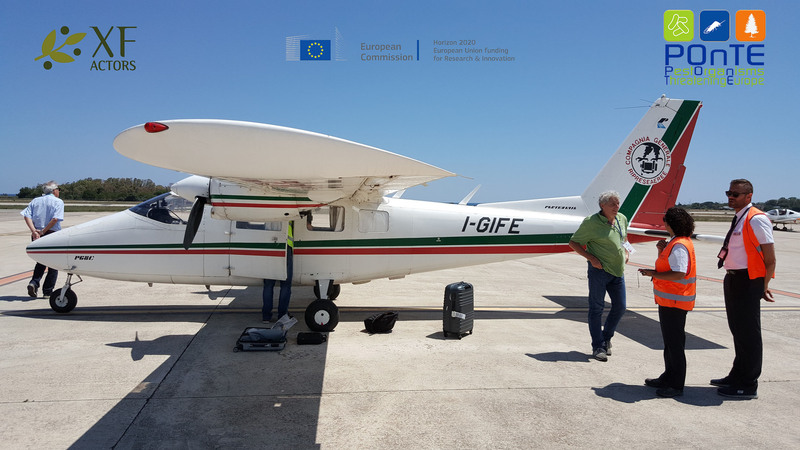 Installation of the cameras inside the plane before the flight, work carried out by Alberto Hornero (IAS-CSIC, Cordoba, Spain) at the Brindisi airport in Puglia. 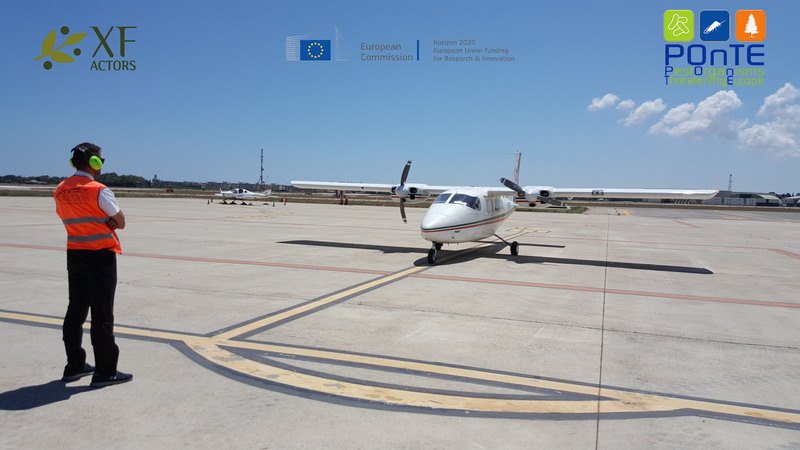 The plane ready to take off from Brindisi airport to fly over 1200 ha of the Puglia infected zone. 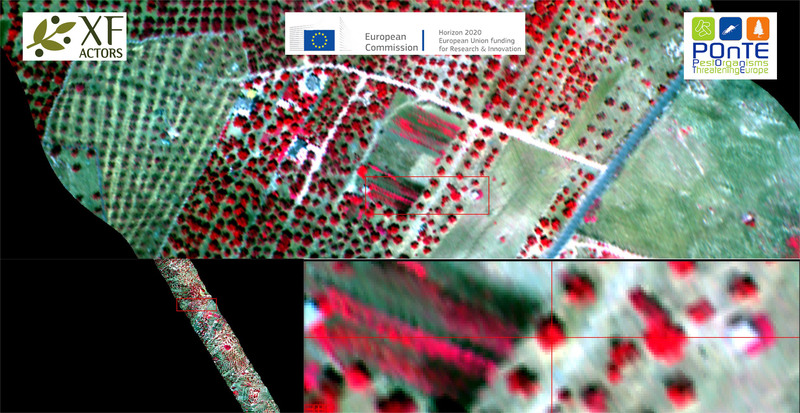 Hyperspectral image acquired at 50 cm resolution over one of the study areas of Xylella fastidiosa where field evaluations took place. The images were processed after the aircraft landed at the Brindisi airport, conducting image quality assessment on the same day of the airborne campaign completed on July 4th, 2017. Calibration work conducted in the field at the time of the flight in one of the study areas, measuring atmospheric irradiance using a spectrometer by Carlos Camino (IAS-CSIC, Spain) in the centre of the picture, with the collaboration of Miguel Montes and Juan Antonio Navas from IAS-CSIC (Cordoba, Spain). Calibration targets used for the post-calibration of the thermal and hyperspectral images, with the IAS-CSIC personnel acquiring atmospheric measurements. 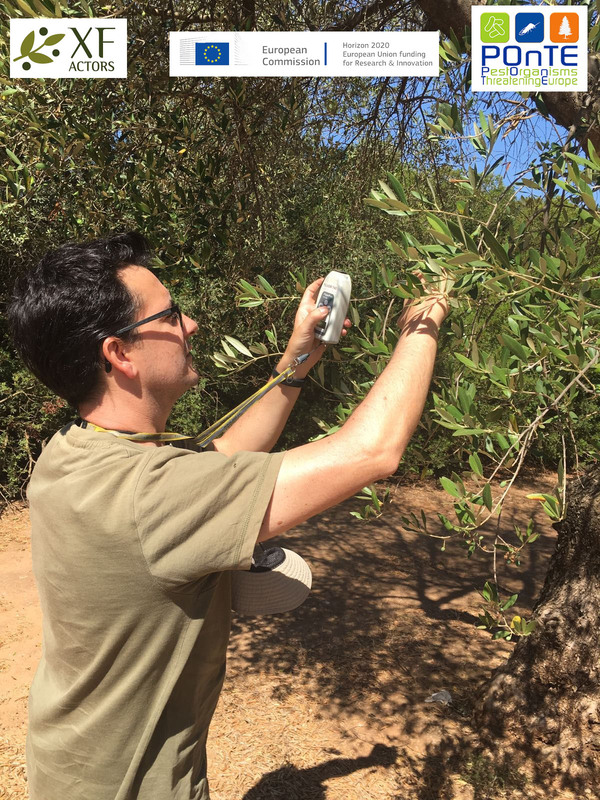 Carlos Camino (IAS-CSIC, Cordoba, Spain) measuring fluorescence on olive leaves from one of the selected trees used for the field evaluation. 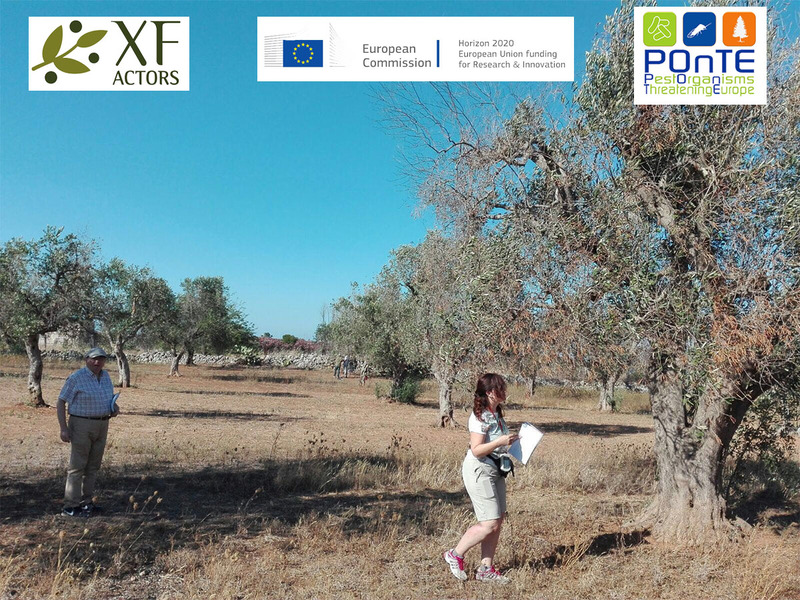 Field work carried out by CSIC scientists Juan Antonio Navas and Blanca Landa, evaluating Xf disease severity and incidence levels on selected olive orchards in the Puglia infected zone.